Our Discover Farming classroom at Washingpool Farm is open! The Melplash Agricultural Society’s new initiative – Discover Farming – is all about helping young people to understand the connection between food and farming and the important role that farming and agriculture play in the local economy and environment. It is hoped that by making them more aware of the importance of fresh food and healthy eating, we will also encourage them to think about the career opportunities in agriculture that are now available, many brought about by the introduction of new technologies. In this way the Society hopes to inspire the next generations to take up careers in this exciting industry, not just in farming but also other rural-based industries. The opening of a Discover Farming Classroom at Washingpool Farm enables the Society to provide local schools with a new resource where they can take children to learn about all aspects of farming to food production. “We feel it is really important to help young people to understand more about fresh food , farming and healthy eating and to realise what an important part farming plays in the local economy and local environment ” said Marcus Beresford “People who work directly in agriculture are the best qualified to deliver the message. Having the classroom and teaming up with Vicky and Simon Holland at Washingpool Farm, who have been running school farm visits for some years, has enabled us to engage with local schools. Some of whom are already planning Discover Farming visits into their 2015/16 curriculum”. Cllr Rebecca Knox cutting the ribbon with Society Director and Trustee Marcus Beresford. 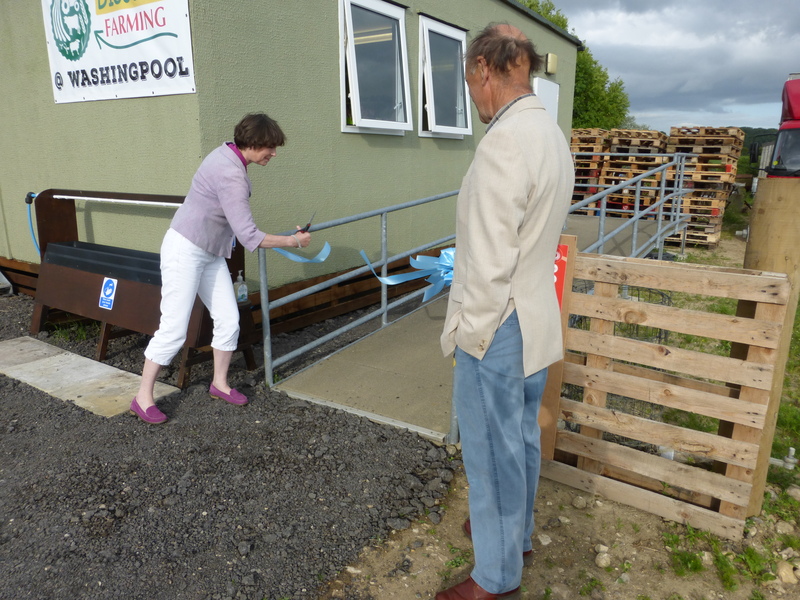 The official opening of the Discover Farming classroom was attended by sponsors, supporters and volunteers of the Society who have helped to make the initiative a reality. The official opening of the classroom was performed by Councillor Rebecca Knox, who was instrumental in obtaining the classroom from Dorset County Council. The redundant classroom came from Wareham Middle School which is now closed. Society Directors, George Streatfeild and Marcus Beresford with help from Bryan Wrixon disassembled the classroom ready for collection and transportation, which was kindly undertaken by fellow Society Director, Philip Hardwill of P H Hardwill Construction, ably assisted by brother Mike and nephew Luke. 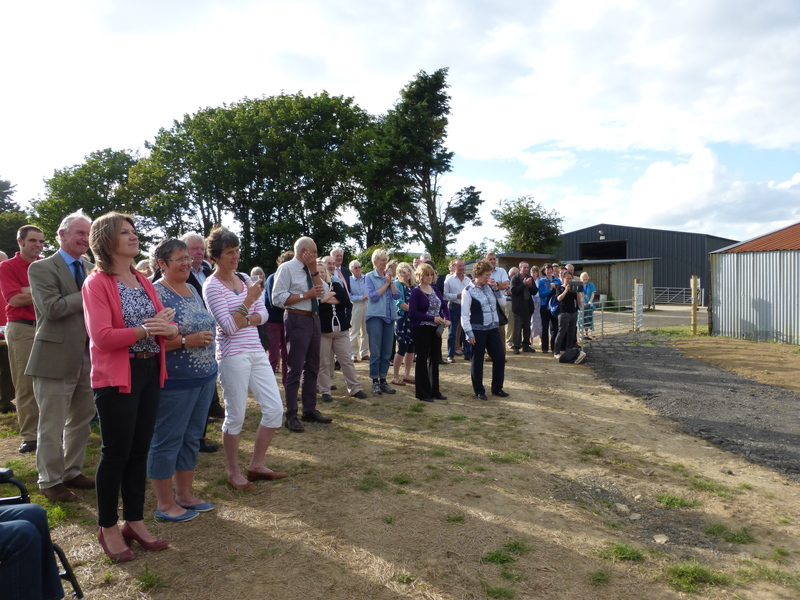 The opening was attended by sponsors, supporters and volunteers of the Discover Farming project. Throughout the year, Simon and Vicky Holland of Washingpool Farm, Bridport DT6 5HP www.washingpoolfarm.co.uk will be hosting school visits where children will see ‘up close and personal’ a number of farm activities and animals. The bus company, Damory, has offered a subsidised transport rate for local schools which will be further subsidised by the Society, so visits will be possible for even the tightest school budget ! Visitors to this year’s Melplash Show on August 27th will be able to take a Discover Farming Trail around the show field and by answering a number of questions about farming will have the chance to win a number of cash prizes. In the new dedicated Discover Farming Marquee, there will be a fantastic selection of ‘Farm to Food’ activities and interactive demonstrations where children of all ages can get hands on experience.